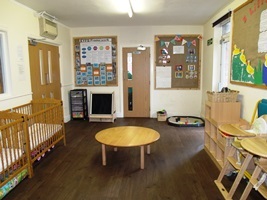 Our self-contained Baby room offers a "Home from Home" environment in which the individual needs and routines of every child are followed to help with a smooth transition into the nursery setting. 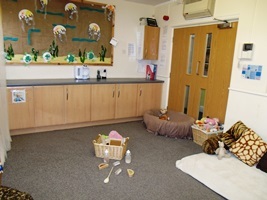 We aim to make your baby's day enjoyable, safe and stimulating and encourage their natural curiosity and creativity. A typical day would include a selection of sensory activities, musical play, messy play, physical play, arts, crafts and free play - both indoor and outdoor all of which encourage growth and development. We also take advantage of our local amenities and take the children out on short trips to visit the shops, park and beaches on a regular basis. 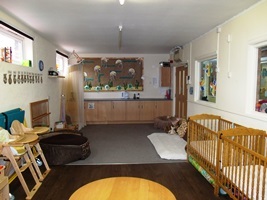 During your child's time in baby room the parents/carers will be given an Early Years Diary. The Early Years Diary will be used to communicate key information between home and nursery. When your child is ready to move on from the baby room, the experiences gained will have prepared them for the more advanced activities planned in the Tiny Tots room.